YouTube video gets HDR upgrade | What Hi-Fi? You'll now be able to watch HDR content on YouTube via Chromecast Ultra and Samsung 4K TVs. 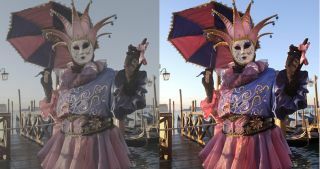 YouTube is to begin High Dynamic Range (HDR) support, in an effort to give video content on its platform a greater range of colours, increased subtlety and better contrast, as simulated in the image above, which has been supplied by Google. From now, you will be able to watch HDR content on compatible televisions or via a Chromecast Ultra. Samsung's 2016 SUHD and UHD TVs will be receiving an update later this year. YouTube now joins Netflix and Amazon Video in providing 4K and HDR video, however it still has some way to go before HDR is fully integrated into its software. If HDR content is played on a Standard Dynamic Range (SDR) screen, YouTube will downconvert the video. But YouTube has warned that this might reduce picture quality. For 'challenging' clips, it says, the process "might not deliver the perfect result", warning of the potential for additional noise in darker areas. YouTube's web-based editor, in which creators can do basic colour and lighting correction, is yet to get HDR support, according to the BBC. YouTube says videos which have been colour-graded are more at risk of being distorted by the downconversion, which defeats the point of making the improvements.